(Trent Nelson | Tribune file photo) Sen. Lincoln Fillmore, R-South Jordan, asks a question during the Health and Human Services Interim Committee hearing on the Utah Medical Cannabis Act before the special session, Nov. 26, 2018. Fillmore is involved in negotiations over a tax-reform plan that Republican lawmakers may launch in coming days. 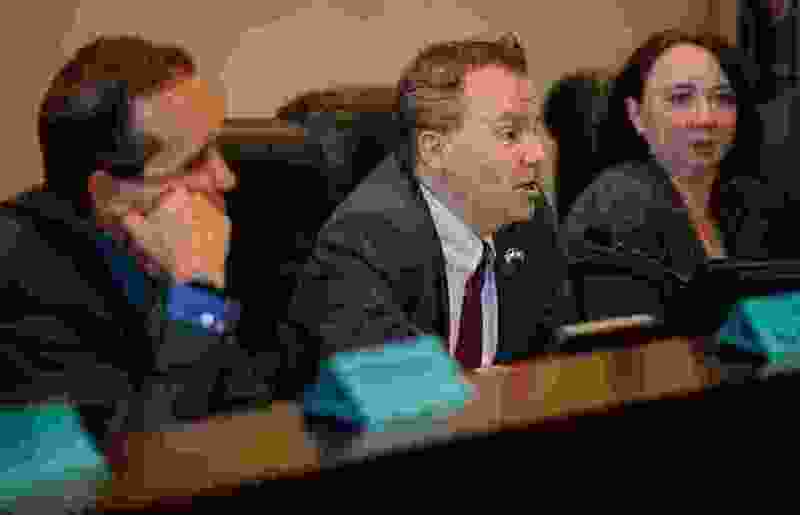 In a pair of closed-door meetings Thursday, Republican Utah lawmakers urged their House and Senate colleagues to get behind a large-scale and politically challenging tax-reform effort, which could be publicly unveiled next week. The Thursday meetings did not include specific tax proposals, according to South Jordan Republican Sen. Lincoln Fillmore, but instead stressed the looming threat to the state’s budgets posed by a shrinking base of traditional, taxable sales. Gov. Gary Herbert and legislative leaders have been vocal about the need to “modernize” Utah’s tax structure, particularly by applying sales taxes to a larger pool of service-oriented businesses like haircuts, ride-sharing apps and lawn care. But with roughly one-month remaining in the 2019 session, lawmakers say the time is drawing short for what is all-but-certain to be a controversial and challenging piece of legislation. Asked what services and industries could face new taxes, Fillmore said he has several ideas, but that those lists are the subject of ongoing negotiations between himself, his counterpart in the house — Heber City Republican Rep. Tim Quinn — legislative leaders and the governor’s office. He suggested some things might be too politically challenging to tax — such as tuition payments, real estate transactions and medical care — but that “everything” is up for consideration. Fillmore offered only two concrete predictions of tax exemptions that could be repealed: interior car washes and “unassisted amusement devices,” or the gaming tablets most commonly found at chain restaurants. Fillmore said Thursday’s meetings went well, and that he expects to provide his legislative colleagues with more details early next week and hopes a bill could be filed by next Friday. “I think we did achieve knowledge that the problem is immediate and the solution is urgent,” Fillmore said. In the House, Quinn said his caucus talked about problems with the state’s existing tax structure but didn’t discuss the specifics of the reform bill now taking shape. And he said House Republicans closed the caucus meeting so members could speak freely and ask questions without their comments appearing in the media. Asked when his bill will be filed, Quinn said his best guess is about 10 days away. “I’d have to look at my calendar to see,” he joked. On Thursday, Gov. Gary Herbert reiterated that tax reform is his number one priority this year, and that any changes should includes a substantial tax cut to residents. He initially called for a $200 million tax cut, but later raised his number to $225 million to match the request of House Speaker Brad Wilson, R-Kaysville. Herbert said tax reform is a tough issue, with industry representatives and taxpayers nervous about changes that affect their wallets. But the state is approaching a “fiscal cliff," he said, and it’s better to correct course while the economy is producing surpluses than to wait until a crisis hits. Tribune reporter Bethany Rodgers contributed to this article.